Master Marf: What the Crap 4chan? Yes, that's the picture from the Guy Fawkes Mask post from December 17th, 2009. 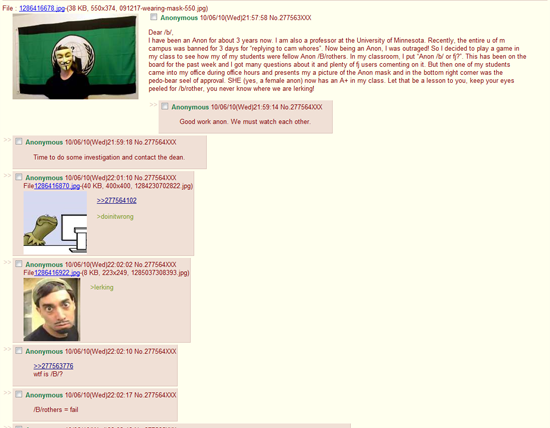 No that was not my post on /b/, someone else posted that picture. What has this world come to when people are impersonating me of all people?! Well, if it got her an A+ in the class, whatever works. That 'professor' spelt lurking wrong... There also several other grammar errors that a professor, even one that wasnt majored in english while in school, should never make. This bugged me alot lol You fail sir. Good day. @ Six Legions: Well yeah, the guy wasn't really a professor. You never take anything said on 4chan as true. He as just a troll. Dude. Why- why would anyone not want to be you? You're almost as cool as Tucker Max. @ Forrest Taylor: I don't have my own Wikipedia article. I'm nobody... Yes, that is how you determine someone's greatness.